Red Feather is a non-profit organization that builds sustainable straw bale housing and community centers on American Indian Reservations with the help of the tribal communities and public volunteers. Red Feather also educates Indian nations on straw bale building methods, enabling tribes to establish frameworks for long term self-sufficiency. The dwellings are very efficient and empowering way to help solve the acute lack of housing on reservations. Michael Lindsay, President of studiovertex incorporated wanted to create an educational tool for Red Feather to use in the winter to support the organizations seminars on straw bale construction. He found that most books on the subject tend to complicate the methodologies by showing different approaches and possibilities. 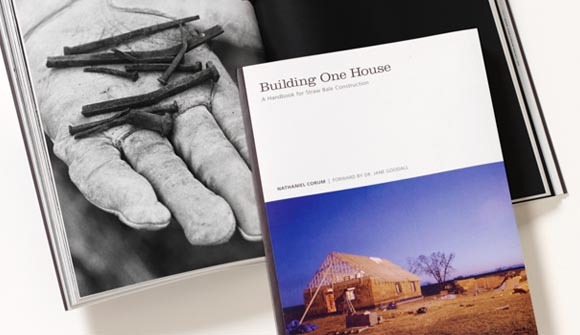 The book “Building One House” focuses on one specific straw bale structure. The material is organized in a clean manner, integrating photography, illustrations and exploded views of all diagrams for clarification and reinforcement.